I remember the time I was waiting on the set for a photo shoot of a well-known political candidate. He and his bodyguard appeared, headed straight towards my assistant Albert, and shook his hand, assuming he would be the one to be taking the photograph and I would probably be applying makeup to his worn-out face. The same situation arose on several occasions, until I started hanging my camera around my neck a few minutes before each shoot –a caricature of sorts, like a painter holding a paintbrush– until I managed to put an end to the misconception. Those gentlemen thought it unlikely that a woman would be in charge, that she would have the sense and the guts to direct that decisive moment in which reality becomes fiction and banality is used to construct an image of power. I realized that all those years of fighting for equality had not been enough and that they were only the beginning of a long battle in which, fortunately, more and more people are involved. I wonder whether the great Lee Miller was aware of how advanced, brave and modern her approach to work and life was. I wonder whether she knew that thanks to women like her, the future was already female. Creative women with an artistic, social, speculative and philosophical discourse sometimes continue to face a twofold barrier. Not only do they have to prove the value of their artistic statements; they also have to struggle to have their statements judged not as gender-based or militant feminist pieces, but rather as works in their own right. The fact that this pioneering woman has contributed so much (not only as a unique figure, but also as a member of that large network of artists) makes me believe in the generosity of shared ideas and of the greatness of reciprocal inspiration. I wonder whether the new prevailing order, this sort of dictatorship of individualism through social media, has made us lose our true collaborative spirit. We appear to be more connected, involved in and informed about everything that affects, concerns or interests us, but the fact is that we are much more isolated and willing to settle for the mild commitment of a “Like”. True collaboration must be transcendent, active, useful. It requires an open exchange of ideas and shared experiences – not links. Much has been said about the magnetism of film stars, but we pay far less attention to the exercise of seduction involved in producing a portrait. The ritual often becomes a battleground. The photographer tries to lead the sitter onto his or her turf, and vice versa. Lee Miller was on both sides of that battle. She had experienced the vulnerability and the power that you feel in front of a camera, working as a professional model –and, later on, behind the lens, taking photographs. It’s not something that happens very often. 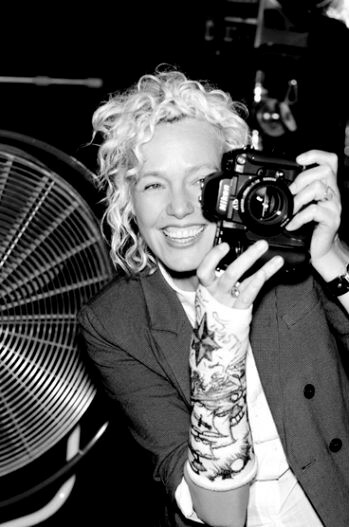 The most interesting case I know of a model with an urge to learn the craft who became an influential figure in the fashion world is that of Ellen Von Unwerth. Much like Miller, she had a very difficult childhood, began working as a model, and soon moved behind the camera only to become one of the most relevant photographers of her generation. And, like Miller, she ended up being featured in Vogue, the bible of fashion. Aside from her style, what fascinated me when I discovered her was how she portrays women as hedonistic, sensuous, liberated. Having felt the potential for discomfort in front of a camera may have allowed her women protagonists to feel safe and free. One thing that strikes me as immensely innovative about Miller is that in the last period of her life she experimented with the idea of gastronomy as a form of protest: the power of food as a means for projecting an intellectual discourse not devoid of disagreement and a critical spirit. 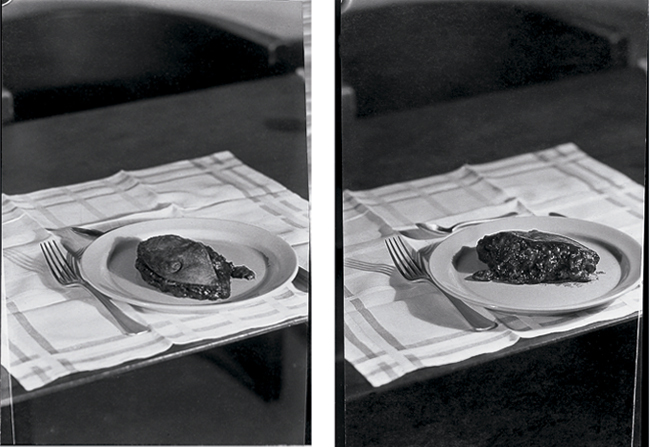 It was clearly revolutionary to photograph the severed breasts from a radical mastectomy served on a plate as a critique of surrealism (the movement to which she belonged) for its tendency to objectify the female body. Even now, perhaps more than ever, there are artists who continue to seek inspiration in the surrealist movement and use food as an element in their compositions. Pierpaolo Ferrari does so, in my view, in a distinct, interesting way, mixing it with humour and social criticism, sometimes with a smattering of cynicism or a touch of irony, in a very contemporary manner. Now that we are deeply immersed in the foodie era, we also find a combination of surrealism and food in publications such as The Gourmand, whose art direction in photography is characterized by irony, beauty, and an approach to all things gourmet with artistic rather than solely functional expectations. In fact, in one of its issues, the magazine pays tribute to Miller in her role as an exquisite gourmande and cook. Photography has changed a great deal since Miller. 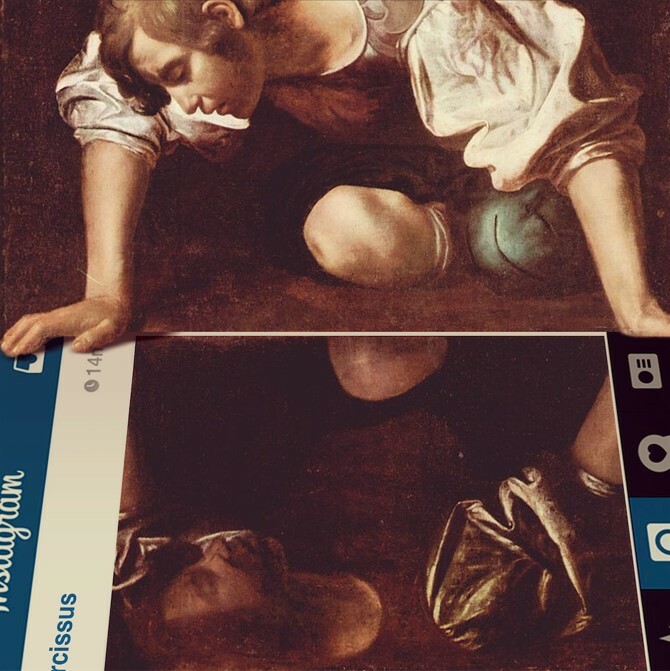 The medium has been in constant evolution, surviving all sorts of catastrophes and visual overloads. At a time when we are utterly saturated with images, it is refreshing to discover the work of contemporary women photographers like Rinko Kawauchi, where the focus is placed on simple moments in our daily lives. Her beautiful, poetic images portraying intimate, sensuous details in everyday settings are almost visual haikus that lead us to the love of small things and of silence. Kawauchi does not want to forget what is usually forgotten today. And thus, with the conviction that forgetting is not an option, I look back and find comfort in knowing that the future was already female. The course was set by Miller, and many more: these women showed us a path on which multidisciplinarity, disruption and nonconformity would be the arms for fighting the archaic, pre-established roles of an immature, patriarchal society.